PRODUCT: L14-30P Male Electrical Plug, Heavy Duty 30 Amp, 125/250 Volt, NEMA, Twist Type Locking. Price/Each. DESCRIPTION: L14-30P Male Electrical Plug, Heavy Duty 30 Amp, 125/250 Volt, NEMA L14-30P, 3P, 4W, Twist Type Locking Plug, Industrial Grade, Grounding. 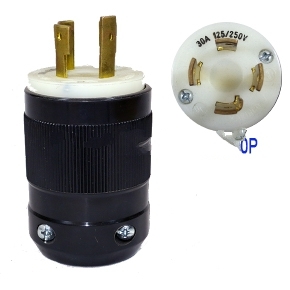 L14-30C ELECRICAL PLUG, HEAVY DUTY 30 AMP 125/250V FEMALE CONNECTOR, 4 WIRE 4 PRONG, TWIST TYPE LOCKING, POWER PLUG. PRICE/EACH.